I’ve been looking through old photographs and taking new ones and I’m coming to realize that the ones I like the best are very abstract. Recently I was out on a walk and came across some orange honeysuckle. 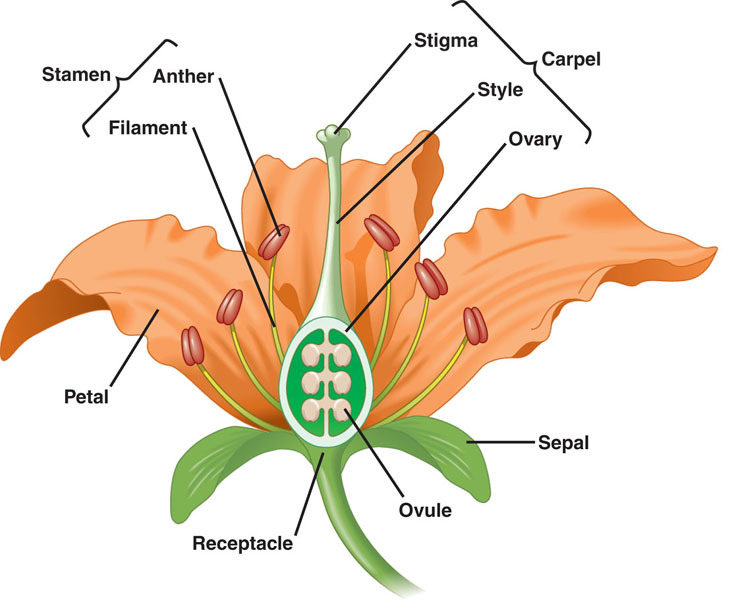 I was drawn to a particular bundle that was nearly spent… all that remained was the base of the flower (sepal) and shoots coming out of it (style) [flower diagram]. Unfortunately, I did not have my camera and I told myself it was not the best light anyway. I passed by this bunch a few days in a row, always without my camera and at what I deemed the wrong time of day. Finally, I took my camera (and ring flash) for a early evening stroll and hoped that the bundle was still there. That particular bundle was no longer there, but I was able to find one in a similar stage of its life cycle, plus the sprinkler system must have watered the area recently so I was also able to get waterdrops! Waterdrops from rain is rare around here, so naturally, that is what I love photographing, the elusive. I know that these are from an orange honeysuckle… but what I think I love about them is that they are so abstract that you wouldn’t know it right away. The photo is more about the shapes and the lines than the actual flower… I think that is what draws me in. This entry was posted in flash photography, nature photography, photography. Bookmark the permalink.